Kansas joined Indiana, Iowa, Minnesota, Missouri, Nebraska and South Dakota in this Midwestern sport in 1927 and held its first contest in Bern, Nemaha County. The first National contest in Kansas, held in Norton on November 11, 1930, drew a crowd of 25,000 and was broadcast coast-to-coast on the radio. Oakley Shucks! World War II and the mechanization of corn harvesting ended the era of these huge contests. Kansas was one of the first states to revive the contest when, in 1970, the Logan County Agricultural Agent, Ross Nelson presented his idea for and event that would help get people off the interstate and into Oakley. Ross had been to contests as a kid, but didn’t know how to go about organizing a contest, so he recruited help from Sherman County veteran “corn shucking” brothers, Lawrence and Kenneth House. Nelson and the House brothers developed the contest rules which became the model for the modern day cornhusking contests that serve Kansas and the other Midwestern states that revived their contests. October 11th marks the 43rd annual contest in Oakley. This year we are paying special tribute to the old-time hand husking contests and Oakley’s role in reviving the sport that honors the tradition of cornhusking and Midwestern values. Oakley Hometown Teams pitting Red against Green will start the contest in the field as Case IH and John Deere teams shuck-off in the first heat. Then, the Hometown Team Banks will face off against each other as teams from The Farmers State Bank, The Bank and Peoples State Bank hit the field. Come on out and root for your Hometown favorite. New huskers will train and compete with many long-time huskers from throughout the state. There’s still time to register for the contest – Come by the BBCC or call Kylee at 785-671-1000 for information. Come out and be part of our project to preserve and share this history. Smoky Hills Public Television will be in Oakley filming the weekend events; from the VIP Corn Cook-Off to the last ear of corn that hits the bangboard on the final horn sounding the end of the competition, and everything in between. Bring the family to the contest, cheer on the contestants and join in all the festival events. The contest, the people, the stories and history will be captured for a program set to air next April on SHPTV and here at the Buffalo Bill Cultural Center. Stay tuned for dates and times. Thanks to the following businesses who have provided funding to help support our project with Smoky Hills Public Television: Pioneer Feed Yard, Oakley Farm & Home Center, Logan County Implement, Oakley Motors, Heartland Foods, Peoples State Bank, Mitten’s, Sporer Land Development, Troy & Lori Sporer, Fitz Meats, Western Plains Energy, The Bank, Oakley Area Tourism, Farmers State Bank, Woofter Construction & Irrigation. 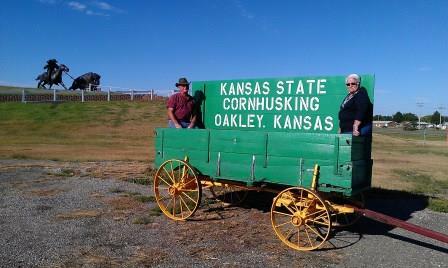 Thanks to Rod Bates for rebuilding and creating our Corn Wagon Display. That’s Granny on the wagon with Rod. She has been driving a tractor in the cornhusking contest for many years. Granny finished the lettering and the wagon was set outside and will be on permanent display at the BBCC. Great Photo Opportunity!